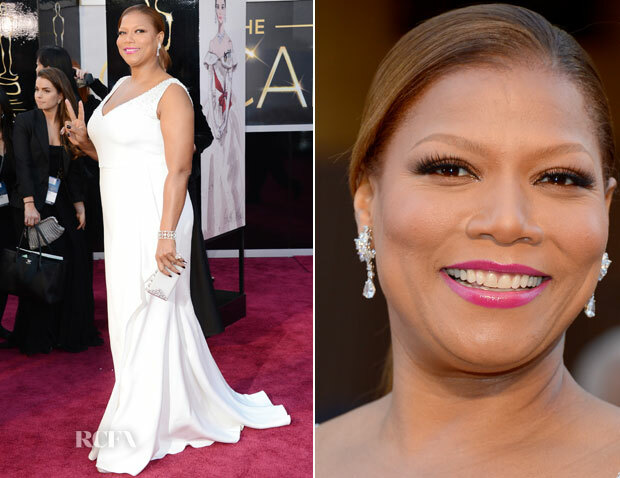 Queen Latifah was one of many actresses to chose white at the 2013 Oscars held at the Dolby Theatre in Los Angeles. The ‘Steel Magnolias’ actress and producer wore a simple Badgley Mischka gown with beading along the straps. As a CoverGirl spokesmodel, it’s no surprise that Queen wore a striking berry shade of CoverGirl lipstick and the shade–along with her lashes, which went on for days, were a beautiful accent to the stark white gown. I love how simple Queen Latifah kept it on the red carpet, and the white is beautiful against her mocha skin.